PHILADELPHIA, PA (BRAIN)—The Adventure Sports Travel Expo, which was scheduled to have taken place November 9-11 in Philadelphia, won't be happening. VANCOUVER, WA (BRAIN)—Environmental and social responsibility rose to the surface among the topics covered at the Outdoor Industry Association Rendezvous last week. The 12th annual outdoor industry conference attracted approximately 350 attendees. LAS VEGAS, NV (BRAIN)—Each year everyone from the bicycle community congregate in the halls of the Sands Convention Center to get a look at what’s new for next year. MADISON, WI (BRAIN)—On the Thursday night of this year's Interbike, Team SchwycleOps, representing Pacific Cycle and Saris Cycling Group, dominated the warm up laps of the 2007 Industry Cup crit race. "There are two types of people: those that talk the talk and those that walk the walk. People who walk the walk sometimes talk the talk but most times they don't talk at all, 'cause they walkin'. Now, people who talk the talk, when it comes time for them to walk the walk, you know what they do? PORTLAND, OR (BRAIN)—Toyota has signed on as title sponsor of the USGP Portland Cup taking place December 1-2. The U.S. Gran Prix of Cyclocross (USGP) is the Official National Cyclocross Team Selection Series of USA Cycling. SUN VALLEY, ID (BRAIN)—Scott USA recently launched its new business to business Web site. The site has been under development between Scott USA and SAP, the company’s primary database software provider. 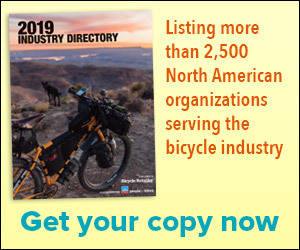 GUNNISON, CO (BRAIN)—Secret Agent Publishing, publisher of Mountain Flyer magazine, will publish the official show guide for the North American Handmade Bicycle Show (NAHBS) and distribute an expanded, post-show guide nationwide in 2008. SUSSEX, WI (BRAIN)—Russell Corporation notified Wisconsin state officials of its intention to close a former Huffy Sports plant, eliminating the plant's last 50 jobs by next March. LAGUNA HILLS, CA (BRAIN)—BRAIN staff members better not be wanted by the justice system, because their mug shots are now online under Contacts. (That is why we think Matt Wiebe is one of the remaining holdouts). EMERYVILLE, CA (BRAIN)—Hydrapak has purchased the Gel-Bot product Line from Venture Design Works. The line's main offering is the patented Gel-Bot bottle, a water bottle that incorporates a separate nutritional gel chamber for a product, combining hydration with nutrition. MONTGOMERYVILLE, PA (BRAIN)—The 2008 Bicycle Leadership Conference (BLC) will be held a few weeks earlier to avoid conflicting with other events such as Frostbike, but will remain in downtown San Diego. The conference, to be held Jan. 18-20 at the Holiday Inn On the Bay, will focus on supplier issues. SEYMOUR, CT (BRAIN)—Thule added The Hawley Company as a distributor of select Thule products in the Southeastern United States. Hawley will offer Thule’s hitch and strap based bicycle carriers and its complete line of SportRack branded hitch, strap and top-of-car bicycle carriers. “No words will ever sum up the measure of this man. A man who lived from the heart. My thoughts and prayers are with those who need the strength to carry on.” -Andrew Hopkins from Scotland said of the late Richard Juryn. "Important announcement: Some hunters have been seen in the woods near Piney Ridge trail and the fish and game commission has raised the legal kill limit on campers to three. So, if you're hiking today, please wear something bright and keep low." —Tripper Harrison from "Meatballs"
BORDENTOWN, NJ (BRAIN)—Princeton Tec Lighting is partnering with Fuji Bikes to continue to expand the Princeton Tec dealer network in the United States. SAN RAFAEL, CA (BRAIN)—Trips for Kids celebrates 20 years of empowering youth with a dinner auction from 6:00 p.m. to 9:30 p.m. on November 3, 2007, at the Mill Valley Community Center in Marin, California.